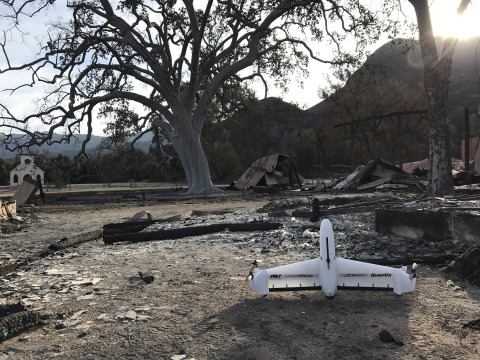 AeroVironment Quantix Drone and Decision Support System To Aid National Park Service Recovery Efforts From Southern California Woolsey Fire | AeroVironment, Inc.
SIMI VALLEY, Calif.--(BUSINESS WIRE)--Dec. 4, 2018-- AeroVironment, Inc. (NASDAQ: AVAV), a global leader in unmanned aircraft systems for both defense and commercial applications, today announced it is supporting the National Park Service Inventory and Monitoring Program to assess the environmental impact of the Woolsey wildfire in the Santa Monica Mountains National Recreation Area of Southern California. Burning over 96,949 acres, the devastating Woolsey wildfire destroyed more than 616 park structures and consumed approximately 88% of National Park Service land within the recreation area. Considered one of Los Angeles’ most cherished open spaces featuring hiking trails and historic structures, the Santa Monica Mountains National Recreation Area is also home to a wide variety of indigenous plants and animals, including multiple protected and endangered species.